The head of the Catholic Church in England and Wales has reopened the abortion debate by urging the government to change the law. Cardinal Cormac Murphy-O'Connor has called on ministers to lower the 24-week abortion limit at a private meeting at the Department of Health. He wants a joint committee of both houses of parliament to review the 1967 Abortion Act. The government said there were no plans to alter the regulations. However, 31 MPs have signed a Commons motion calling for a review of the law. The Catholic church is against abortion altogether, but would welcome a lowering of the 24-week limit as a start. Cardinal Murphy-O'Connor argues that technological advances mean the abortion laws are outdated. Modern medicine can now ensure the survival of some foetuses born before 24 weeks gestation. Doctors debated the issue at their annual conference last year for the first time since 1989, but voted against calling for a reduction in the limit. Health Secretary Patricia Hewitt has already said this year she is not in favour of lowering the limit despite the likes of France, Germany and Italy setting the limit at between 12 and 13 weeks. And Downing Street said the Prime Minister believes the abortion laws are a matter for individual MPs rather than the government. But the church leader believes recent opinion polls have shown public opinion is changing. A survey by the Observer newspaper earlier this year showed that half of women wanted tougher laws. 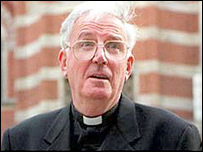 Cardinal Murphy-O'Connor said there was "substantial and growing disquiet in Britain at the numbers of abortions". He said: "Millions of people, especially women, would like to see a review of the current law. "I hope that members of both houses of Parliament will respond by setting up a joint committee to carry out a thorough review of the 1967 Abortion Act." The cardinal also pressed the health secretary to set up a national bioethics committee to robustly discuss issues surrounding end of life and embryo science. He is concerned about the creeping moves towards genetic screening and so-called designer babies. Embryo screening was in the headlines this week when doctors from Guy's Hospital in London said they had developed a new test to screen for a range of disorders. At the moment the Human Fertilisation and Embryology Authority makes rulings on such issues, but is currently subject to a review of its remit. The Department of Health said the health secretary was happy to take the cardinal's views into consideration. But a spokeswoman added: "It is accepted parliamentary practice that proposals for changes in the law on abortion have come from backbench members and that decisions are made on the basis of free votes. "The government has no plans to change the law on abortion." And Melissa Dear, of FPA, formerly the Family Planning Association, said she was against a reduction in the limit. "Only a small minority of women have abortions after 20 weeks - about 1% - and for these there are good reasons. "There may be genetic abnormalities or the women may be just before menopause or in their teens when periods are irregular and they may not have realised they were pregnant." However, Liberal Democrat MP, Phil Willis, who chairs the Commons science and technology committee, said there was a "clear consensus" among the British public that the legislation should be reviewed. He said: "What my committee is saying is that there ought to be a thorough review of the scientific evidence, that that should be placed at the disposal of Parliament and if, in fact, there is a need to reduce the time limit, then that should be the case." The latest figures show more 185,000 abortions were carried out in 2004, but only 124 were carried out at 24 weeks.